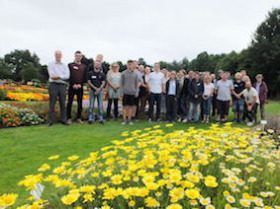 The Garden Centre Association (GCA) is hosting its second annual Plant Area Forum for plant area managers and plant buyers at Ball Colegrave July 20, 2017. The event will once again be facilitated by GCA inspector Roger Crookes who is the organisation’s Ruxley Rose plant area competition judge this year and believes passionately in the power of plants. “Our first Plant Area Forum last summer was a big hit with all those who attended,” said GCA chief executive Iain Wylie”. “It was a highly motivational day and this year’s event promises to be just as inspiring. Bookings so far this year are ahead of last year’s but we can now take more people if others would like to join us. Delegates will be asked to share ideas and information, discuss the challenges they face, analyse sales and profitability and discover potential opportunities. To reserve your place which costs £79 per person complete the booking form on www.gca.org.uk or contact the GCA office direct on 01244 952170. Food and refreshments will be provided. “All delegates will be asked to carry out some pre-Forum homework because part of the day will include a session to benchmark key performance indicators to help people assess their own centre’s performance against others,” continues Mr Wylie. “They’ll share information and come away with new ideas and be challenged to think differently. “Using the information they bring, delegates will analyse the space occupied by a category in relation to the value of sales for that category. So, it might be that we find some plants occupy a great deal of space but that doesn’t justify the sales they generate or vice versa. It promises to be an enlightening and profitable day all round.